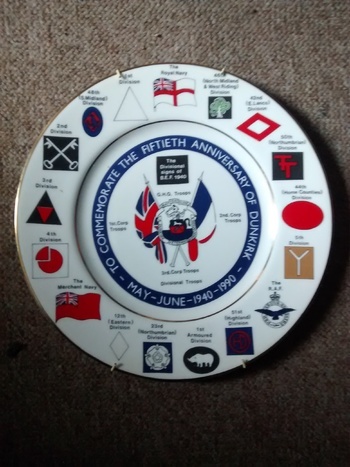 In Military and Wartime > World War Two > Show & Tell and China and Dinnerware > Show & Tell. Edwardian Fine Bone China Dunkirk Fiftieth Anniversary Plate with wall holder 27cm diameter. Has the divisional signs of B.E.F 1940. G.H.Q Troops, 2nd Corp Troops, 1st Corp Troops, 3rd Corp, Troops Divisional Troops. On the outer rim are all the Military services who took part. 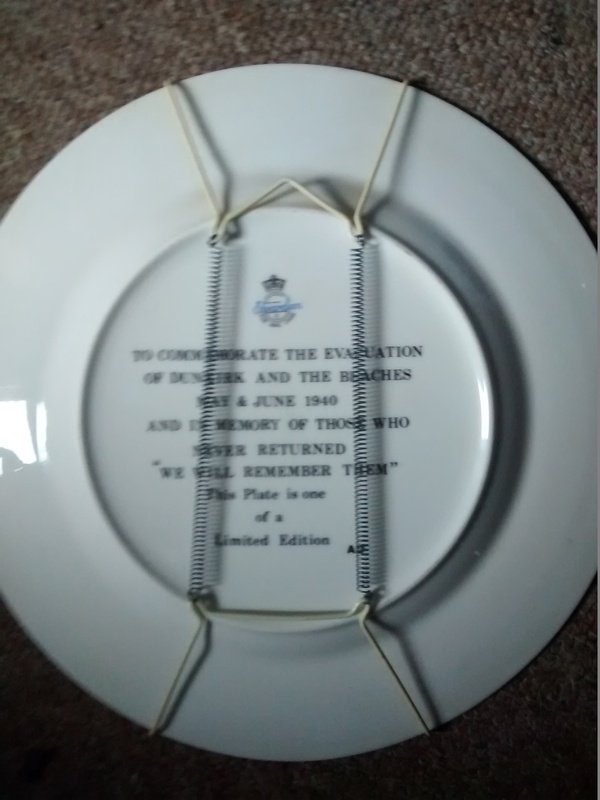 On the rear it reads To Commemorate The Evacuation of Dunkirk and the Beaches May and June 1940 and in memory of those who never returned "We will remember Them"
This plate is one of a limited edition AD. Dunkirk. Must have been a horrible experience, from what little I've read. When I was in high school, I had a friend whose dad was on one of the beaches on D-Day. 19 years old. He said he was scared sh_tless. Said all he could do was bury his face in the sand and bawl like a baby. Said he peed in his pants. But he survived the war and came home a "hero". God, I hate War. like Presidents, Prime Ministers and Kings. and leave us people be who love to sing. Come and sing a simple song of freedom. Sing it like you've never sung before. that we the people here don't want a war." You have the right idea Nevada. Problem is, nobody listens ! I know I will be hated for saying this, but each time I see Americans waving all those thousands of flags, -- I am reminded of Nazi Germany ! What a shame ! I always think of the civilian craft that assisted in the operation - fishing boats, yachts, ferries - shuttling back and forth to get the soldiers off the beach, and those men having to wait their turn.